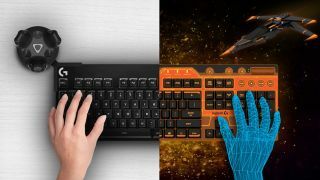 Logitech’s latest peripheral invention is a keyboard that’s designed to be used in virtual reality. As those who have tried to type with a VR headset on will know, it’s a rather odd and somewhat challenging experience – even for those who know the keyboard layout so well they never have to look at the device – and this new peripheral aims to tackle this issue with the HTC Vive. The company’s solution is to use one of its Logitech G gaming keyboards, with a Vive Tracker attached to the top-left of the keyboard using a cradle accessory, along with the Logitech Bridge developers kit (SDK). This combination of hardware and software gives you a 3D model of the keyboard in your VR environment, offering a fully ‘real’ and natural typing experience, enabling you to look down and see your (virtual) hands on the (virtual) keyboard. Pretty neat, huh? It’ll certainly be useful for those interacting with apps or surfing the web via a VR desktop, but will also be a boon for gamers, at least in those titles where typing is necessary. Logitech has priced the kit at $150 (around £115, AU$195), but note that at this point, the company is still testing the solution, and only supplying it to a limited number of developers (50 devs to begin with – applications to be involved close on November 16). Depending on how the initial testing goes, and the level of interest, more VR keyboard kits may then be produced. And with any luck, down the line, the product will be available for consumers who want a more real and intuitive typing experience in a virtual reality environment.